We Dutch invented a lot during the centuries. From the microscope in 1590 to modern capitalism in the 1600’s to Wi-Fi in the 1990’s. So you could say that the Dutch people have a history and tradition in inventing and discovery. One of the inventions I am most proud of (although it is an American icon) is the corncob pipe in its current form. The history of the corncob pipe begins with the native Americans, who showed the European colonists the multiple usages of corn. Then Henry Tibbe, a Dutch wood-turner, emigrated to America from Enschede in 1867. 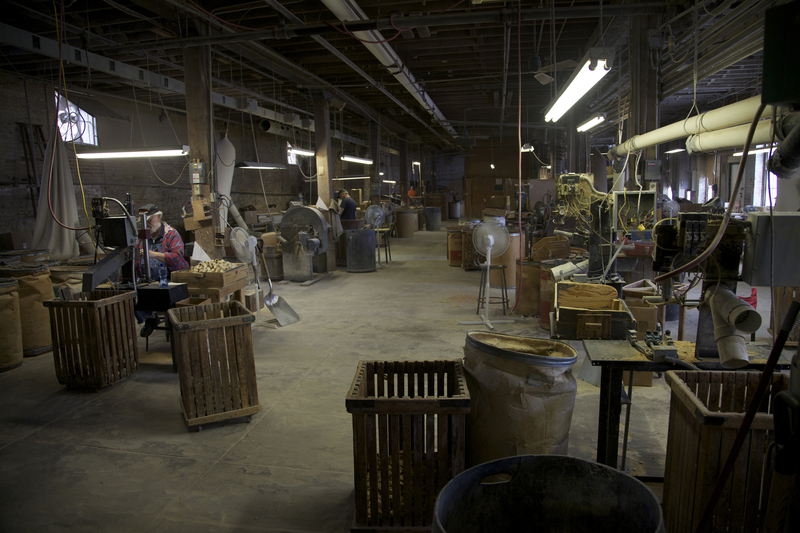 After fire destroyed his home and factory in Holland he brought his family and his skill as a wood-turner to Washington, Missouri. Soon after that, he set up a small woodworking business making spinning wheels, wooden handles, furniture etc. : H. Tibbe & Son Co. Some time in 1869 a local farmer whittled a pipe out of a corncob. He liked it so much that he asked Henry Tibbe to try turning some on his lathe. Apparently the farmer was pleased with the pipes he got so Henry made a couple more and put them for sale in his shop. They were such a fast-selling item that in no time he was spending most of his working hours making pipes for his customers. Soon Tibbe went into full time production of corncob pipes. Unfortunately the corncob pipe tended to burn out easily. Luckily Henry Tibbe had an idea for fireproofing it. Tibbe’s 1878 patent describes his process for fireproofing by applying a plaster of paris type substance to the outside of the corncob, then sanding the bowl smooth after it dried. This procedure not only fire proofed the cob but also hardened it, allowing it to be worked on a lathe. By 1878, with increasing demand for his corncob pipes, Tibbe had moved his business to a new location and increased his production by employing a steam engine to turn the lathes and operate the other machinery. In January 1883 Henry and his son Anton applied for a U.S. patent for a trademark for their pipe, calling it the Missouri Meerschaum. They choose that name because Tibbe compared his light, porous, cool smoking corncob pipes with the more expensive meerschaum pipes. In 1896 Henry Tibbe died. 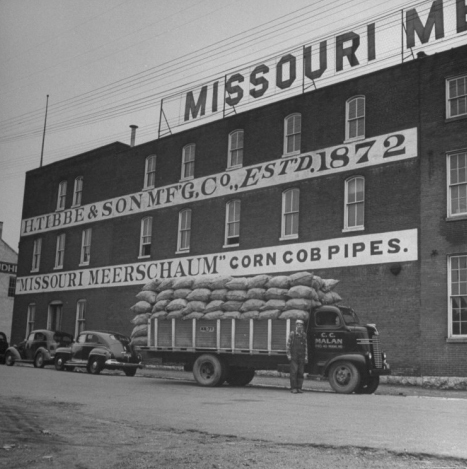 Anton took over and in 1907 the H. Tibbe & Son Co. became the Missouri Meerschaum Company. 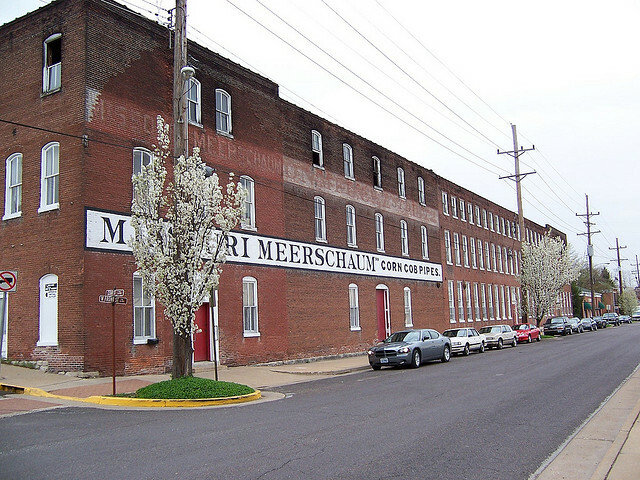 During the years that followed, Missouri Meerschaum pipes became increasingly popular. A large distribution system was established for the sale of Tibbe’s pipes. The wooden building which originally accommodated the H. Tibbe & Son Co. was soon replaced by a two story brick building. Later this building had a third floor added and over the years more additions were built. Ownership changed hands in 1912 when the company was purchased by Edmund Henry Otto. 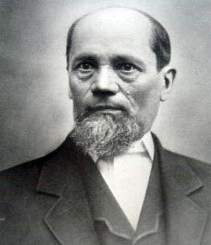 Still Anton Tibbe supervised the company until 1921. He then disposed of his interest in the pipe factory, retired, and moved to California where he died eight years later. The company remained in the Otto family for over fifty years. In 1978 it was acquired by Fendrich Industries Inc. of Indiana. They owned it until 1983 when it was sold to John and Geraldine Brandenburger. In 1988 the company was purchased by the present owners: Michael Lechtenberg, Robert Moore and Larry Horton. Corncobs waiting to be turned into pipes.. In the early days cobs from an ordinary cornfield served nicely for the pipes. Now the pipes are made from a special white hybrid corn which was developed by the University of Missouri. This variety produces big, thick and tough cobs. The reason why the cheap Chinese-made copies do not work and burn through the bottom after the first smoke. The corn is grown on 140 acres in the Missouri River bottom which is owned by the company. Employees do the corn picking and carry the corn to the crib area. Also located in the river bottom. The corn is shelled using only old, out of production shellers which date back to the 1930’s. This because the newer shellers break up the cobs.. 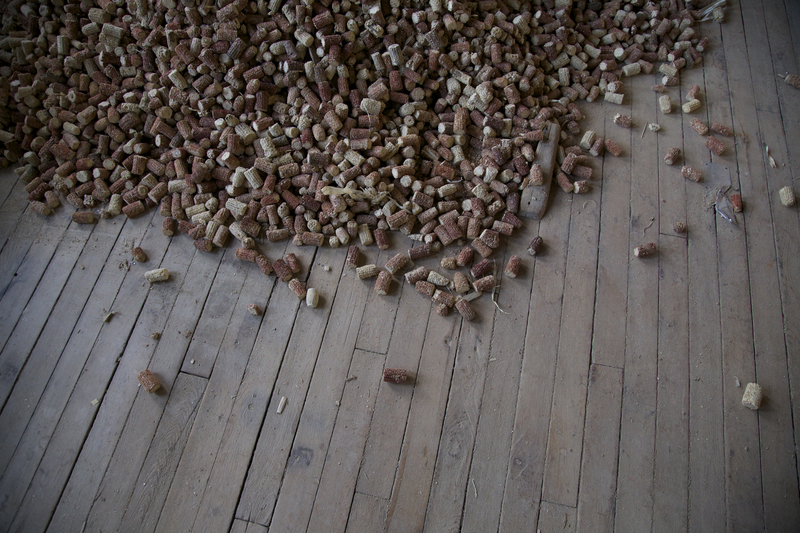 The cobs are then stored in the upper two levels of the factory for about two or three years until they are ready to be processed. A glimpse inside the factory. These days about 30 to 40 employees work in the same old brick building of Henry Tibbe. They produce, pack and ship around 3,000 (!) pipes per day to nearly every state in the USA and lots of foreign countries. 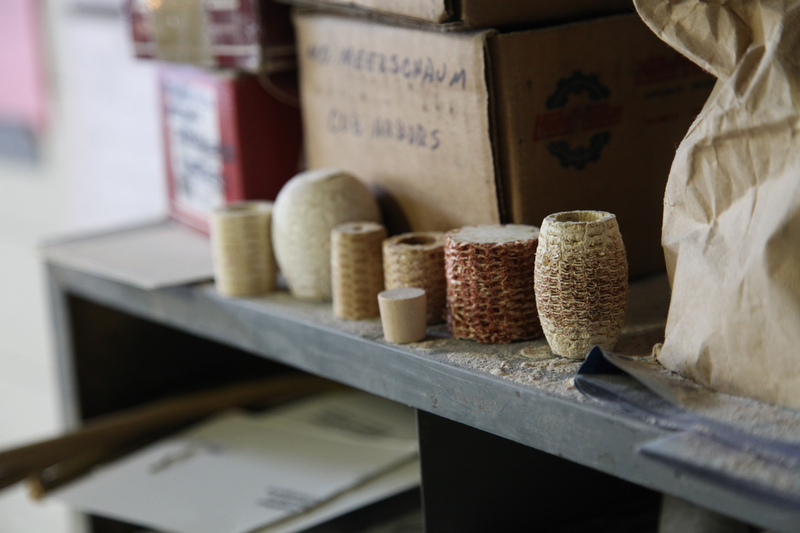 The making of corncob pipe has not changed much since those first pipes were made. It still takes a lot of hand labour. Some operations have been automated by cleverly adapting machines from other uses. 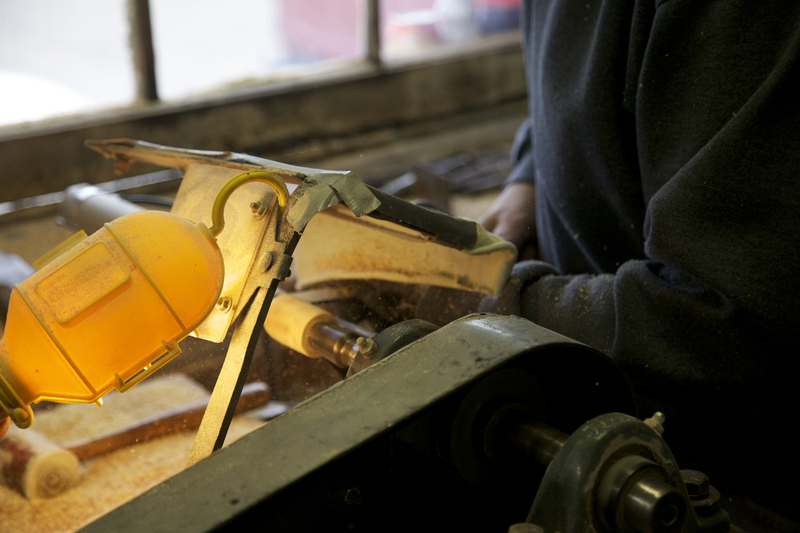 The shaping of a cob during the production process. The production begins with the cobs being dropped into a chute which sends them down to the lowest level of the building. The remaining husks are removed and then the cobs are put into multiple gang saws. There they are cut into uniform lengths. The corncob pieces then fall onto the conveyor belt of a grader that sorts them by size. Tobacco holes are bored into the cobs and then most go to one of the four turning machines to be shaped. The pipe style is determined by the turning or shaping process. Some larger pipes are still turned by hand. The white plaster of paris type coating is then smeared on the bowls. They are sanded smooth after a day of drying. A boring machine bores the stem hole. The bowls are then varnished either by being tumbled in a cement mixer or run through a lacquer spray booth. Then they go to the finishing room where they have a metal ring attached to the wood stem that has been printed to look like a cob. The plastic or acrylic mouthpieces have a filter inserted and then they are hammered into the stem. The stems are glued into the bowls, a label is placed on the bottom, the pipes are packaged and tadaaaa! Ready for shipment. Pipes of all sizes are made, but most set you back less than $10! 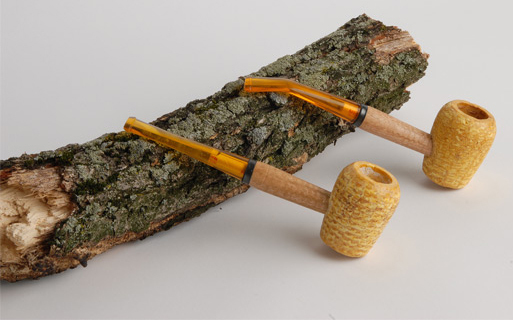 There are lots of different styles of corn cob pipes being produced today. Most styles also have a variety of bowl shapes and come with either a bent or straight stem. – As I said before Missouri Meerschaum uses plaster of paris and lacquer to finish their pipes. A black stain is applied on a few models. Usually it does not cause a problem on the inside of the bowl but sometimes it can be a nuisance. So if you want to you can lightly use sand paper to remove anything and everything other than cob from the inside of the bowl. 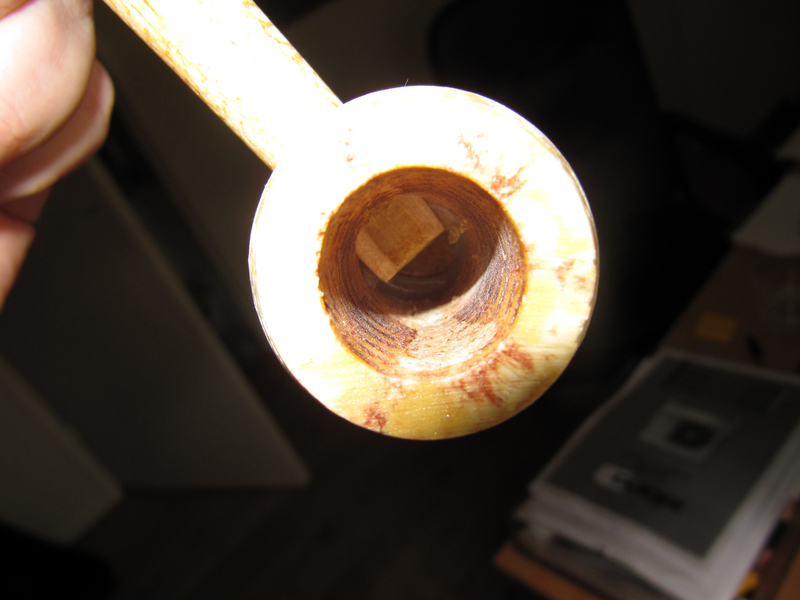 – The wooden shank that extends inside the bowl is sometimes removed by cob smokers. With the models with hardwood bottoms this is no problem. But other versions will become more prone to burnout if the inner shank is removed. Then again, I seldom read someone had a burnout. But to be safe I would not advise Dutch pipe smoker forum-member Jos to buy cobs.. If you still really want to remove the inner shank then please use these inside the bowl. Cob with some glue residue inside the bowl. – The glue used in making cobs is non-toxic. So if you see some residue inside the bowl, don’t be alarmed. You can leave it or carefully scrape it out with a small knife. – Let the cake in the bowl build up a bit. It allows the cob to absorb moisture better and this results in a cooler and drier smoke. – Because corncobs pipes can absorb a lot of moisture you have to be careful with damp weather. The cob then needs some extra drying time. – I smoke all kinds of tobacco in my corncob pipes except for latakia. Some way or another there is no match.. However, Semois and other burley based tobaccos taste great in cobs. And if you (unlike me) are very handy with tools you can read here how to make your own cob. Last but not least, for the woman pipe smoking fetishists (I know there are a lot of you perverts, I can see it in my website-stats!) here is a *ahum* nice, classy picture of a young woman with a corncob pipe. Great write up. Interesting you mention Latakia. I have not smoked that in a cob and I guess now I never will! You’re welcome 😉 Also check out these links: http://pipesmagazine.com/pipe-babes-2014/ or http://pipelovinladies.tumblr.com/. Have fun! there indeed is truth in your ugly message (you won’t hear me calling you redskin or dumbass). So I updated my blogpost as you can see. Steve Guardez, there was no need for that foulmouthed outburst, Arno did a great write up as most normal people would agree.